Disclosure: This is not a sponsored post. 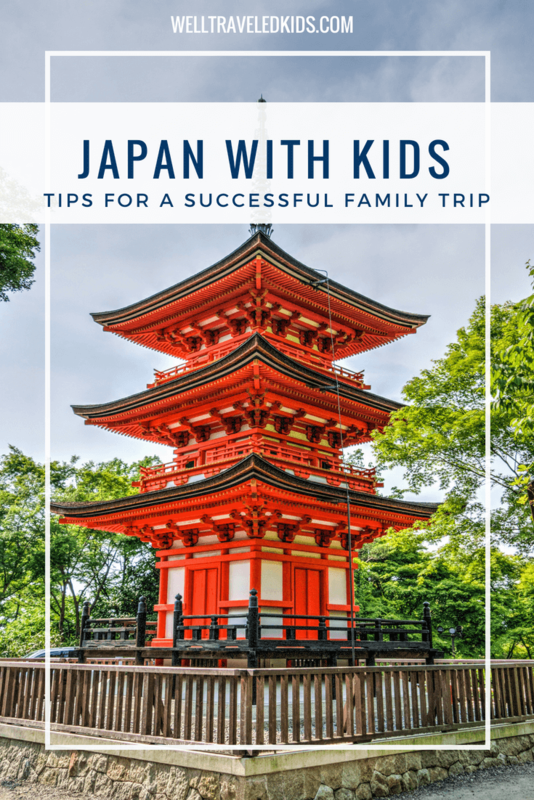 We loved this family vacation I’m excited to share our story of traveling to Japan with kids! Our trip to Japan last summer was a dream come true! I dreamed of visiting this beautiful country for years, maybe even decades. Sharing this adventure with our children was a truly wonderful experience. Truth be told, having never been to Asia before, there were many things that concerned me about visiting Japan with kids. How would the children handle the long flight? How bad would the jet lag be once we got there? Would the language barrier be a big issue? Would the kids eat anything?! In the end, everything went very well, and our family vacation to Japan was easy, painless and an absolute delight! After years of traveling with our kids, we’ve learned that it’s always best to not over-schedule. We choose to appreciate and enjoy the little surprises that pop up along the way. 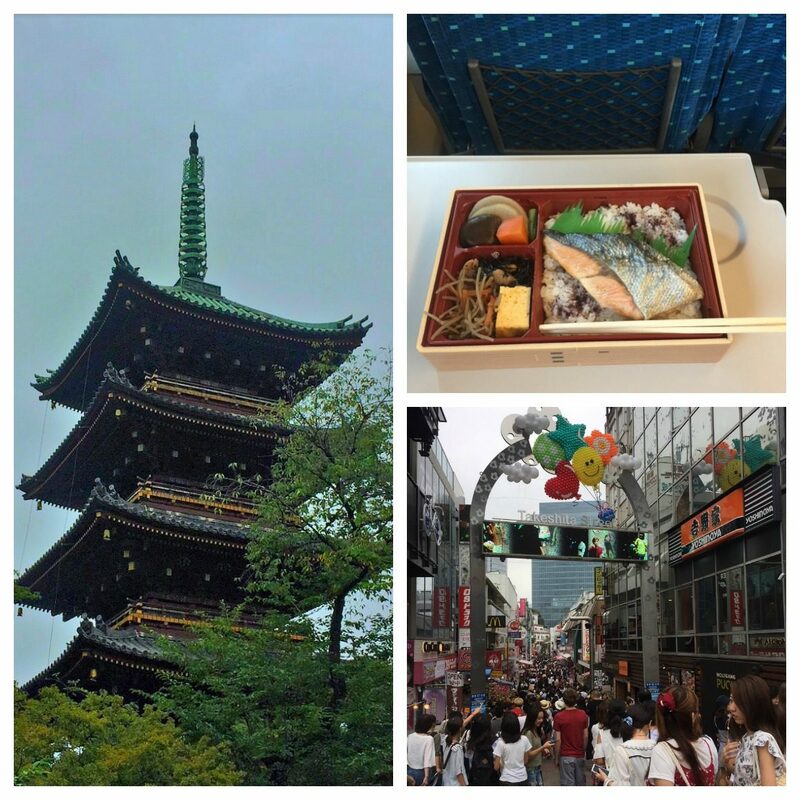 Keeping this mind, we opted for a simple and fun first visit to Japan, with only two destinations: Tokyo and Kyoto. As expected, the worst part of the trip was the long flight…over 12 hours! But since there’s nothing that can be done about it, we just spent those long hours eating, watching movies and trying to sleep. We let the kids watch all the movies and play all the video games they wanted, without any of the restrictions they have at home. They were thrilled, and eventually collapsed and fell asleep. As it turns out, jet lag was not a big deal. Coming from the Chicago area, 14 hours behind Tokyo, we found that we generally woke up super early, like 5am, and then we’d be dead tired by 9pm. So, we decided to just go with the flow and use the jet lag to our advantage. We got up with the sunrise, which happens to be when Shinto shrines open anyway, did our sight-seeing in the morning, and then we just went to bed right after dinner. Food also turned out not to be a difficult adjustment. Our kids can be picky eaters at home, so I was a little concerned, but both Tokyo and Kyoto are large cosmopolitan cities with wide varieties of foods available. The children found lots to eat that they loved, particularly different varieties of Japanese barbeque! Several weeks before our trip, we bought Japan Rail Train Passes from a travel agent who mailed vouchers to our home. Japan Rail Train Passes cannot be purchased in Japan, but only from another country. For a set price, these tickets grant the passenger unlimited train travel in Japan. (Read the fine print for restrictions) Since we would be traveling round-trip from Narita Airport to Tokyo (on the Narita Express) and from Tokyo to Kyoto and back (on the “Shinkansen” or Bullet Train,) it made sense for us to buy the pass. Once we arrived at Tokyo’s Narita Airport, we found the Japan Rail office and exchanged our train vouchers for actual train tickets. The process is super easy and everyone in the rail office thankfully speaks English. The agent helped us reserve all of our train travel at that time, picking days and times, and even reserving seats. It was great getting it all done on our first day and not having to worry about it afterwards. Inside the city of Tokyo, the Japan Rail Yamanote Line also services many popular sites, so we were able to use our same tickets in the city, without additional cost. There is a separate Tokyo subway system, but we actually never used it as the Yamanote Line went to all the touristy spots we were interested in. For the first leg of our Japan family vacation, we stayed at the Hilton Tokyo, a beautiful modern hotel. Hotel rooms in Tokyo are small, so we got two adjoining rooms: one with a double bed and one with two twin beds. The staff at the hotel was wonderful. Everyone spoke impeccable English and was extremely helpful and accommodating. The Hilton Tokyo is located near Shinjuku train station, also on the JR Yamanote Line. This is one of the largest train stations in the world and is connected to a nice shopping center. The Shinjuku neighborhood is also where the Tokyo night life is, but since we were all in bed by 9pm because of jet lag, I couldn’t tell you anything about that! Our first day in Tokyo, we went to Harajuku. This is both the neighborhood name and the name of the train station. From the train stop, we took a nice walk into a small forest and visited the Meiji Shrine. Then we walked back to the train stop and went to Takeshita Dori (kids loved the name of that street!) This is a pedestrian street with lots of music and fashion stores and teenagers dressed like anime characters! On that same day, we took the train to Shibuya to see the famous busy crosswalk. There is a Starbucks located on an upper floor, in one of the buildings overlooking the square, and we just sat at the window for more people watching! On another day, we took the train to the Tokyo National Museum, a beautiful museum with samurai swords, ancient kimonos, Buddhist sculptures, painted screens, and more. It is part of a museum complex located inside Ueno Park (the train station is JR Ueno Station.) There’s also a zoo, a science museum, a museum of western art, a lake, and pagodas everywhere. We ended up only visiting the National Museum because the kids got distracted by a festival of traditional Japanese drummers on the main plaza. You never know what you might stumble upon in the streets of Tokyo! For our trip to Kyoto, we took the JR Bullet Train (“Shinkansen.”) Before boarding, we stopped at the station market and bought bento boxes to eat at our seats. Very fun! Again, all our train travel was pre-arranged on our first day at Narita airport, so it was just a question of finding our way around the station, then finding our reserved seats. The Tokyo Train Station is large and crowded, but it is also well marked and there is staff available to assist confused tourists like us. In Kyoto, we stayed at a ryokan, a traditional Japanese inn. What an amazing experience! 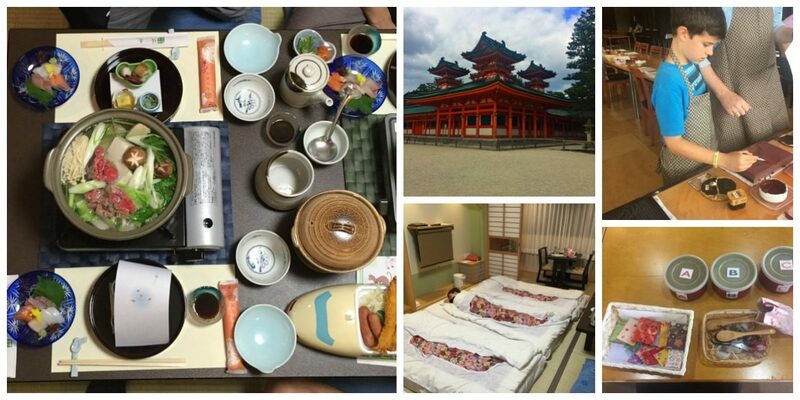 We stayed at Ryokan Watazen, which caters to both Japanese and Western tourists. This ryokan is child-friendly, so it felt both authentic and comfortable. We had one large tatami room with a small private bathroom with shower. Breakfast is served in the communal dining room, where we had a reserved table every morning. For dinner, two ladies in kimonos served dinner in our room every night. They set up a low table for us to sit around and served an absolute feast of delicious dishes. The amount and variety of food was such that even our picky eaters tried lots of new dishes and discovered new favorites! After dinner, the ladies clear everything away and set up four futons directly on the tatami floors. And there we all slept, next to each other. It was a little crowded but such a fun adventure for our family! The staff at Ryokan Watazen was great and helped us purchase Kyoto bus passes to use during our stay in Kyoto. We visited Nijo Castle, which the kids loved. The castle has “nightingale floors.” These are purposefully squeaky wooden floors, created by the architect so ninjas couldn’t sneak up on the shogun in the middle of the night and kill him! The architecture and decorative arts of the castle are beautiful, and we also enjoyed walking around the grounds and seeing the large koi ponds. Some days, we’d go for walks and just explore. We walked around Gion, the historical neighborhood and geisha district of Kyoto, with its narrow streets and small wooden tea houses. We also strolled around long covered markets and shopping areas, looking for souvenirs to bring back home. One particularly memorable activity was a visit to the Kyoto Handicraft Center. We arrived in the morning and signed up for two afternoon workshops. Then we ate lunch and visited the nearby Heian Shrine, with its huge orange tori gate and beautiful gardens. When it was time for our workshops, we returned to the center to learn about traditional Japanese woodcut prints and the art of mixing incense. The children even got to make their own prints and assemble their own small incense bags to take home. Our family trip to Japan was both a delight and much too short. The kids still talk about it often and we can’t wait to return as a family!